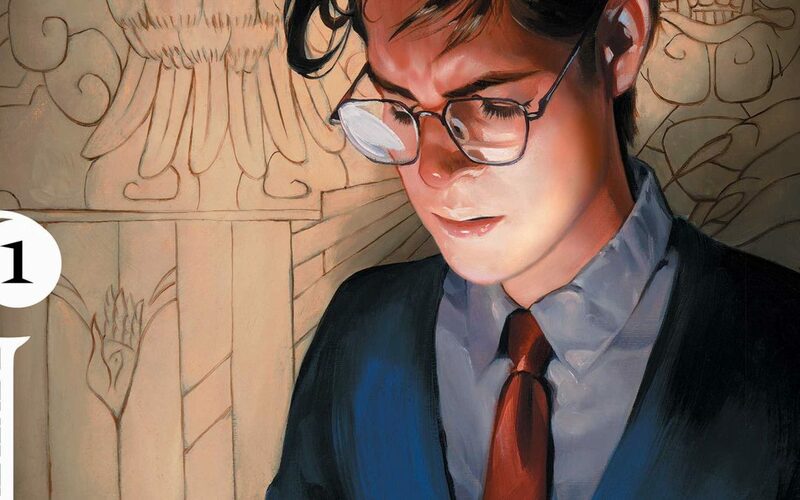 BOOKS OF MAGIC #1 Review 10/10: magic means consequences, so read cautiously, for the Books of Magic in Timothy Hunter’s hands hold a mysterious and a heavy burden for the emerging teenage magician. Realism, mystery and suspense emanate from the story. Vertigo’s magnum opus premieres what may be the best standalone storyline of the new brilliant Sandman series in BOOKS OF MAGIC, written by Kat Howard, Illustrated by Tom Fowler, Colors by Jordan Boyd, Letters by Todd Klein, Cover by Kat Carpenter, and curated for The Sandman Universe by Neil Gaiman. The following review of BOOKS OF MAGIC #1 may contain SPOILERS***. Books of Magic equal consequences. What could go wrong when Books of Magic hold the keys to Tim becoming the most powerful magician in the universe? 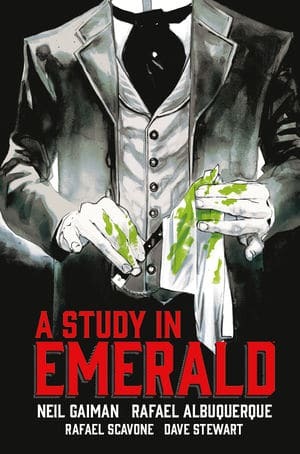 At the start, Tim steps into a fairy tale and magicians show him the ways of magic throughout the ages of the universe. Fowler’s art styles change dramatically as parts of Tim’s journey are revealed in an ancient wall carving, a fairy land, and even a Picasso-esque glimpse into the “End”. One look conveys a Big Bang-like quality, but abstract and possible end of the universe, while Tim Hunter is then brought to a choice of “safety” or “magic” as panels become a tumbling deck of cards that are his potential life. Howard’s strong grasp of the characters’ personalities is evident in the sharp, pointed dialogue. We can all remember back to interrupting a teacher, maybe after having fallen asleep, and their ability to bring the class to attention. Dr. Rose shuts down a bully, at least while in her class, instantaneously with a look and a sentence. Timothy Hunter’s destiny is there, should he choose to the find path of magic. And just because Tim makes the initial choice of initiation does not mean that he is miraculously gifted with powers or the ability to do anything magical. Tim Hunter’s first attempt at magic is a failure. He tries to impress his crush Ellie with paper shreds he says will become a magical flower. Tim Hunter is a teenager living in London, insecure (as we all are or were), whose Mom and teacher have disappeared. Dr. Rose replaced Tim’s teacher in a timely manner, and she may or may not be responsible for bloodily murdering her predecessor in The Sandman Universe 1 (see “Neil Gaiman’s The Sandman Universe 1 Unravels Dreaming” for a brief recap). Dr. Rose reveals herself to Tim following his fistfight in the school’s hallway. She explains that no magic comes without a cost. It is an ominous note, especially considering she may not have his best intentions at heart (remember the bloodied predecessor). But Dr. Rose does give Tim his first Book of Magic. “Your destiny is to find your magic in books…” she says. But this, the first of the Books of Magic, is blank. It will remain blank until he is ready. Tim is astounded and impatient and the book goes blank again. The grim tone shifts toward a back alley where three hooded figures share a vision of Tim in a oil barrel. And with that we close on the outside of Tim’s home, with an assassin standing bye, with knives drawn, repeating the message of censorship. And a furious Dr. Rose looks on at the hooded assassin . . . with her fist clenched. When can I pick up Issue #2 from my local comic shop? “BOOKS OF MAGIC #1 Review 10/10: Magic Means Consequences” was written by R.J. Huneke. Neil Gaiman’s The Sandman Universe 1 unravels Dreaming and the ramifications are stark. 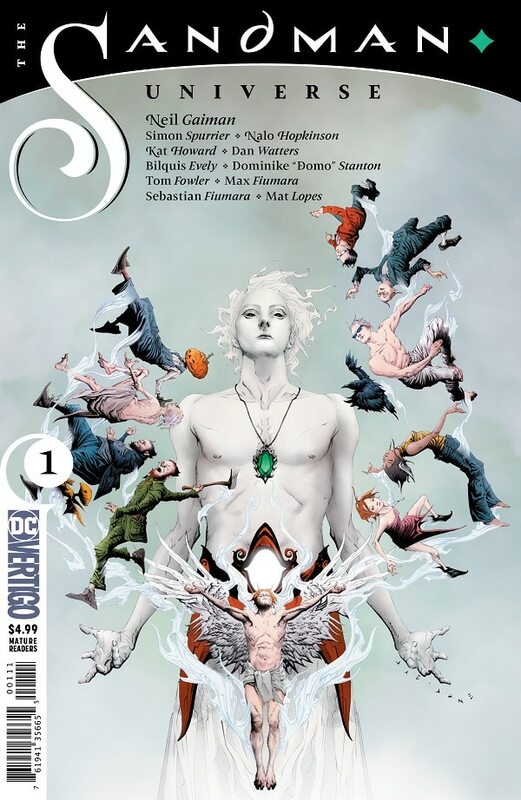 The DC Vertigo relaunch has begun with a BANG! The Sandman Universe 1 one-shot is riveting, visually visceral and stimulating, and features impactful storylines that merge for one hell of a tale. Speaking of hell, Lucifer is in a bad state. It seems he has a son, though impossible, and while the mysterious son seeks to destroy his father’s new sense of humanity, mortality, and mantra of hope, despite a potential wheel of fate forcing Lucifer to relive his pains over and over, Lucifer is off to find the mother of his child. Lucifer’s bar is in shambles, as is his state of mind, his world, and his ravens (all but one at least). 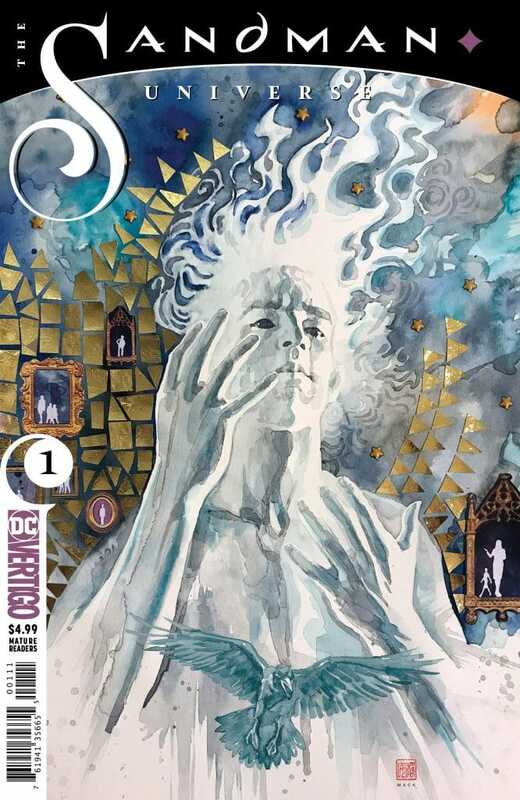 The Sandman Universe 1 has many familiar faces, though Lucien is losing his memory and the Cain and Abel murders are helping to hold back the entire universe of Dreaming from cracking at the seems. Daniel, Dream of the Endless, is gone. And Lucien charges the all-knowing raven with finding him to help them save their increasingly brittle dreamscape. The raven crosses dreams and stories in his search. Another familiar face the raven flies over is Tim Hunter. This sharp story sticks out immediately. Tim’s life as a teenage magician living in the real world offers all kinds of complications. Getting up late, showing up at school late, and finding your book blank when you go to read aloud in class is scary. Finding out that your new teacher knows your secret and has plans for your magic is even more alarming. What Tim does not know, but the raven sees, of course, is that Dr. Rose, with her scarlet scarf, has bloodily murdered Tim’s old teacher in his office with a fountainhead pen to the ear. The Sandman Universe comes from master storyteller Neil Gaiman whose original work on Sandman has been nothing short of groundbreaking. 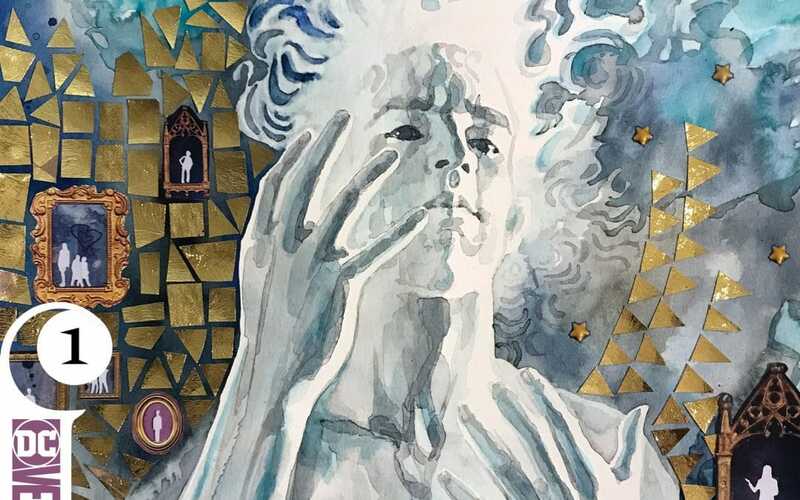 He is working with the talented writers of four new titles to come from the Sandman Universe. 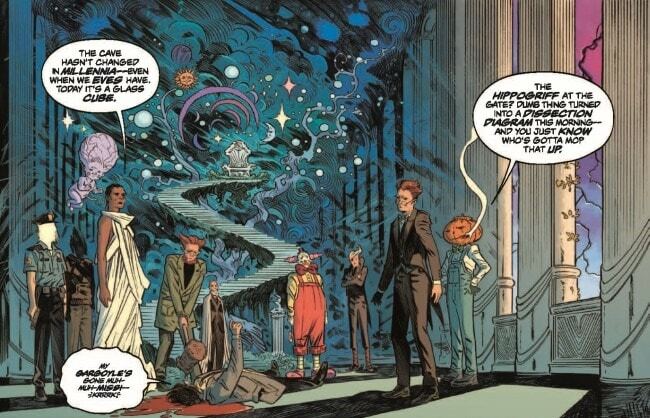 The Sandman Universe 1 introduces the overall state of Dream, Daniel, and the Dreaming. Because the raven knows, he hones in on Daniel in a city dressed as a teenager in Converse All Stars (donning white threads, of course), but he misses him before getting to speak to him. It was like he had him and could not remember the Dream . . . The Sandman Universe 1 story is by Neil Gaiman, and Simon Spurrier, Kat Howard, Nalo Hopkinson and Dan Watters write the yarn here as they set up their upcoming titles. 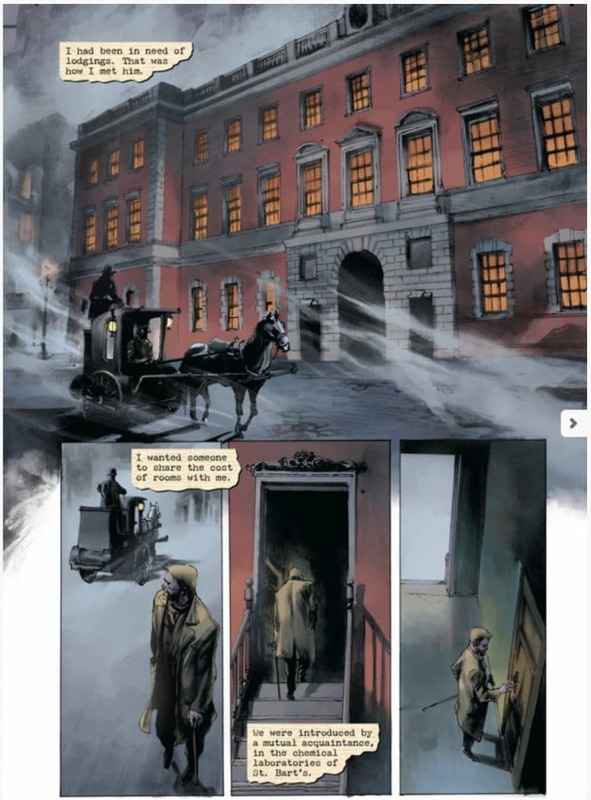 The illustrators of The Sandman Universe 1 are Bilquis Evely, Tom Fowler, Dominike “Domo” Stanton, Max Fiumara and Sebastian Fiumara. Daniel does not want to be found. Has he given up his post as Dream? The Story Continues In . . . The Dreaming #1 that comes out on 9/5/18, The House Of Whispers #1 coming out on 9/12/18, Lucifer #1 out 10/17/18, and Books Of Magic #1 released on 10/24/18 (just in time to get your magic up and running before Halloween). Get ready for a journey through anything and everything dreams car offer and all while the infinite realms possibilities of the Dreamscape are unraveling! Go grab a copy from your LCS, mine is Red Shirt Comics, before all of the coolest cover variants are gone! “Neil Gaiman’s The Sandman Universe 1 Unravels Dreaming” was written by R.J. Huneke.